Sixty four pounds of grapes were picked from a commercial farm near Stoney Creek,ON. Cost was $20.00 per bushel. The grapes were excellent quality. They were made into 35 liters of juice and pressure canned at 15 PSI for 15 minutes for long term storage in batches of seven, the capacity of the canner. My method is singular and unique in that I slurry the grapes then strain. The conventional method is to extract the juice by the steam method. Pictures depict the procedure. 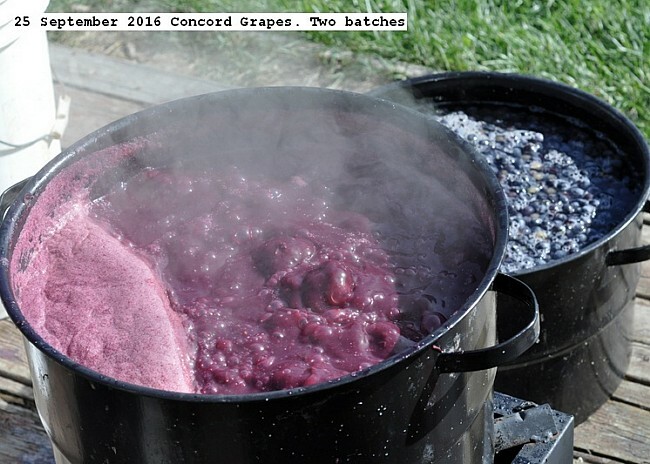 This entry was posted in Uncategorized and tagged 25 September 2016 Concord Grape Juicing, Concord Grape Juicing. Bookmark the permalink.